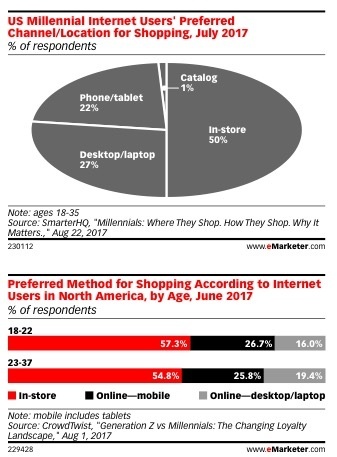 When it comes to shopping or browsing, in-store is ahead of mobile and desktop – this is in line with what expected from consumers starting your search via mobile, and then doing more comparison/research and completing the purchase via desktop. But what’s up with the significant role of brick-and-mortar? That just shows that despite their adoption of tech, consumers still want to see and touch a product depending on the purchase or time of year. 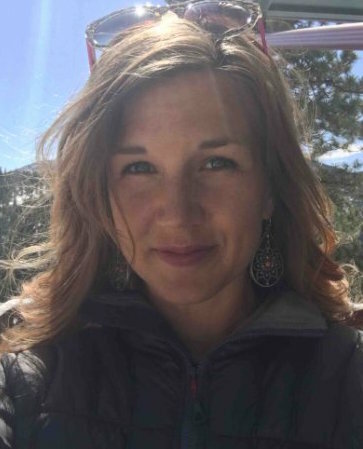 It may be the satisfaction of being in the store, or they’re looking at it as being efficient at the shopping game by supporting the retail experience with research. Either way, in-store still has a stronghold. Another question is whether people feel like they have more time or less time? In-store is often associated with killing time – or conversely, when you’re in a hurry, know what you’re there for, and just need to run in and run out. Amazon’s easy button is slowly replacing the latter, but browsing as a store experience is still very much a thing. 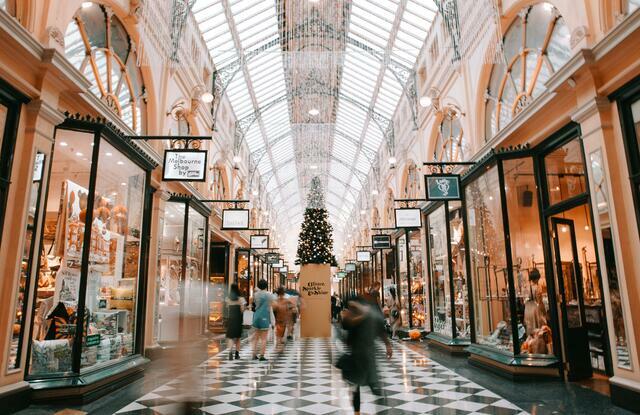 Are you surprised by the data suggesting that brick-and-mortar is still so relevant to younger shoppers? I am surprised. I’m wondering if maybe that’s the social part of their experience. Maybe it’s an activity to do together. Going to the mall with your friends – not necessarily to hang out, but to run errands together. Or maybe it’s the satisfaction for millennials or Zs who don’t want things just coming in a box. When everything arrives by mail, there’s no delight. Maybe it’s adding the satisfaction back into the retail experience. This reconfirms Amazon’s suspicion that in-store is still relevant. With their pop-up stores and moves/rumors to purchase some retailers, they’ve definitely been playing with the experiential component of retail. Clearly, it still matters to people. What about the fact that this data communicates shopping preferences, not purchasing? I think there could be a catch here. People think about shopping as browsing more. I don’t browse an online rack, for example. I may do research or read gift guides leading into the holidays but otherwise, browsing is reserved for in-store. It’s a tactile experience. You may start online and end in-store. But do you ever start in-store and end online? I do, if the store doesn’t have what I’m looking for. Or if there’s a better deal online – although if a retailer is doing it right, that shouldn’t be happening. Do you feel like you have to be on top of it to get the same deal in-store as online? I do. I pay attention to the coupons as I’m purchasing in-store and I often find discrepancies. Retailers are generally good about honoring an offer in-store after I ask, but it leaves me wondering how often customers aren’t getting deals because they’re not paying attention. What does all of this mean to brick-and-mortar as it relates to the in-store experience? Honor your coupons in-store at the register. Don’t take for granted that people are shopping more online. They’re still coming to you, take care of them. So when we’re bridging in-store and online experiences, marketers are struggling. 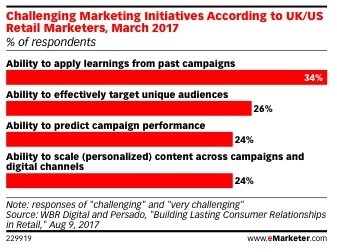 In this chart from eMarketer, 34% cite their ability to apply learnings from past campaigns and 24% cite an ability to predict campaign performance as key challenges. Talk to me about how these things are connected. Companies aren’t structured in their campaigns and programs to make sure they’re measuring in a consistent way. Just trying lots of stuff without measuring, you don’t have a champion and a challenger. Testing is when you have a hypothesis, test, measure (and freeze everything else). There’s a method to it. Just trying ideas like a new audience selection at the peak time of year without measuring doesn’t cut it. Often, people don’t have the test rigor to learn from their campaigns. And they don’t have the time to go back and learn carefully. Many marketers aren’t trained in measurement and analysis, so that lack of in-house expertise leaves a lot of opportunity on the table. According to eMarketer, 24% are having trouble scaling across campaigns and digital channels. What’s the first step to solving this problem? That’s not surprising. The campaign part comes back to applying learnings. And if you don’t have the learnings, it’s hard to draw conclusions that will help you scale across campaigns. The “channels challenge” requires taking different measurement and approaches to the different channels. As a solution, we use media mix measurement across all channels. We’re attributing across the channels so we can see how each and every channel impacts the overall buying experience and consumer action. Whether you’re working across channels, bridging the gaps between online and in-store experiences, or planning campaigns, it really all comes back to knowing how and what to test, which data to look at, and how to act on your findings. And those competencies don’t always live in-house, which is why we see a lot of outsourcing – or outright disregard for the need altogether.